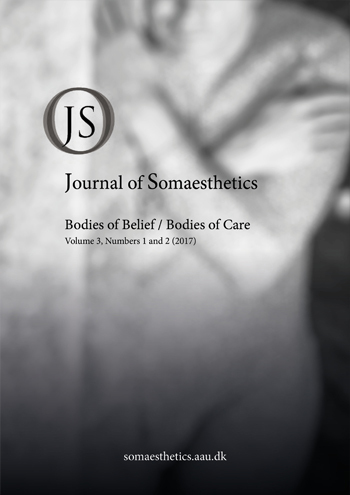 This double-issue on Bodies of Belief and Bodies of Care originated in two conferences held at the Center for Body, Mind, and Culture, respectively January 2015 and January 2016. Only a few papers from those conferences, however, have found their way into this volume; the others collected here came from independent submissions to the Journal. We should begin by explaining the underlying logic that motivated the topics of these conferences and the papers of this double issue? With respect to the question of belief, human bodies are shaped not only by their genetic endowment but also by the belief systems of the cultures in which they develop and function. Such belief systems vary from unarticulated background assumptions to ritualized practices and explicit doctrines or even to formulated laws enacted and enforced by social institutions. The beliefs that the human soma embodies and expresses are not confined to established social norms; they also include items of faith and commitment that are individualistic, nonconformist, or even antagonistic to the cultural mainstream. More than a mere instrument of compliance or worship, the soma is also a site and weapon of protest against beliefs we reject and find oppressive. As to the issue of care, bodies are obviously the targets of one’s daily care in terms of personal hygiene, grooming, exercise, and proper nourishment. They are also objects of care in the sense of worry or concern, since we all suffer illness and death through our bodies. However, the sentient, purposive, active body or soma is also a subjectivity that examines and cares for the body as object, whether it be one’s own body or the bodies of others who one wants to help or comfort. We all need such curative help or comfort at some point in our lives; and some people devote their professional and personal lives to giving such care. Bodies need and give care in many ways and for many reasons: to overcome illness and disability, to address and alleviate dependence, to learn new skills and remedy bad habits, to inspire greater confidence for personal flourishing and greater social betterment. Initially, it might seem surprising to group the topics of bodies of belief and care together. However, if we consider the matter more closely, we see a deep and substantive connection between them. In the first place, beliefs are what make care possible. Because beliefs are our essential guides of action, they are therefore indispensable for guiding our actions of caring for ourselves and others. Beliefs about the body – for example, beliefs about what foods, medicines, habits, exercises, etc. promote somatic health, well-being, and pleasure -- thus govern our practices of care for the body. Issues of belief and care are also linked in the reverse direction. The fact that we care for our bodies, both in the sense of practically acting to care for them and in the sense of worrying about how to care for them, prompts us to search for the best beliefs to guide such care. As the pragmatist C.S. Peirce argued, inquiry is inspired by the irritation of doubt, and it seeks to remove such doubt by establishing beliefs that resolve the particular doubt in question. Our doubts and worries about somatic health and various problems in the functioning and appearances of our bodies promote countless inquiries to attain beliefs that will guide practices to remove or at least mitigate those worries. The things that we care for thus inspire more attention and efforts to acquire correct and helpful beliefs. Although most of our beliefs are items that we simply take for granted and that guide our actions without our giving explicit focused attention to these beliefs, we tend to give more explicit attention to beliefs about things we care about most. Our bodily condition – how we feel, look, and function somatically – is an abiding center of care and concern and thus forms the focus of some of our most explicit and critically examined beliefs. The following papers examine diverse issues of bodily belief and care from different perspectives. Topics range from autoimmunity and psychological therapy to religious belief, tattoos, and neoliberal institutions of health care. Most of the papers adopt an artistic somaesthetic perspective, examining their topics through the methods of literary theory, art history, and theatre studies. The present issue continues the Journal’s tradition of including an interview with a distinguished specialist whose expertise relates to the issue’s topic. On this occasion we are very happy to include an interview with ORLAN, specially commissioned for this issue and introduced by Else Marie Bukdahl. The interview was conducted in French, and we provide an English translation along with the original French.